Well, I can't claim to have created this battleship. I will however try to tweak it so that it makes sense as a 405-point vessel. For the nice PDF that someone made a long time ago, I've attached it so that you see how it looks, the fluff of it and its initial iteration. The Dethroner class Battleship was built in a small numbers during the later years of the 36th Millenium, in the Reeash Forgeworld repair dockyard (Segmentus Tempestus) as a cheap, field conversion of Conquest Battleship. 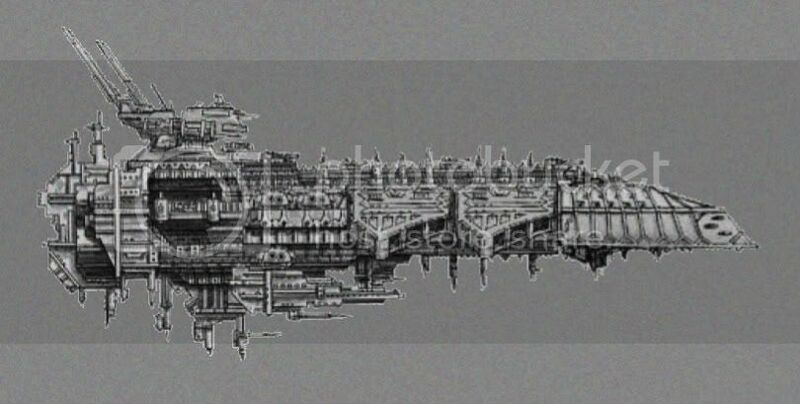 According to Adeptus Mechanicus archives, at least four vessels were rebuilt to this configuration, but nowadays no Dethroner serves in the Imperial Navy. The last Dethoner class battleship - the Saltatio Fidusum - was lost in the Perseus Nebula, when it was captured by two Chaos battleships. She was renamed the Saltatio Damnatibus by its new captain, and disappered for more than one hundred years. In the Second and Third century of the 38th Millenium she saw much combat, and plagued Imperial systems almost throughout the Imperium, wandering from sector to sector, and left only death and destruction behind her, avoiding confrontation with the Imperial Navy. She was finally stopped in an ambush at the Usmeutus passage, when she was crippled and barely menage to escape intact. The Dethroner class Battleship carries Swiftdeath fighters, Doomfire bombers and Dreadclaw assault boats. During the War in the Purity sub-sector in the 38th Millenium, the engines of the Statio Damnatibus were refitted and the mass of the ship was reduced. The ship gains +5cm of speed, but has a reduce launch bay capacity from 3 to 2 at no extra cost. So, full disclaimer: I mostly rewrite rules over making them myself. Where I do create content, I do so by copying stuff that's similar and tweaking it in a kind of simple "zero-sum" fashion. I do this because my understanding of the intricacies of BFG balance is somewhat limited, so anything I have to say on these rules should be taken within the context of comparing it to the closest thing I'm aware of. ...and that would be the Desecrator Battleship. Right off the bat, I notice that the Dethroner has 5 turrets instead of the traditional 4 for Chaos Battleships. I'm not sure the extra turret is necessary unless there's a very specific reason for it to have all 5. Suggestion: 4 Turrets and drop the price 5pts. At this point I'm not sure exactly what to do . My gut says something like boost it to S9 torpedoes, and make both of the weapon batteries F10. If we do that, you're trading Lance Strength for AC Capacity, and gaining +11 Battery Firepower in exchange for 35pts and the weakened AAF drawback, which seems maybe reasonable? But again, it's still just a big slow Desecrator with a fatter top gun (that's resistant to crit damage, since it's 2 guns), and a pair of lances swapped for bays. While it might be worth its points then, I'm not certain that it's necessarily unique enough to really meet the requirements of a totally new class of Battleship. That's about all I've got, I'm sorry to admit. Hopefully someone more knowledgeable than me will swoop in to explain how I'm all wrong . I do really like the look of the ship and the fluff (I'm a sucker for that Repulsive class prow), so I hope you can get the balancing worked out. Thanks Xcal! I had been comparing it to the Despoiler instead of the Desecrator. Now I can compare both ships to the Dethroner. I had chosen to err on the side of caution, but guess I should buff it by all accounts then! The only changes I did to the original Dethroner was making its weapon batteries and lances longer ranged (They all used to be 30cm, something woefully inadequate and flavorless for a Chaos battleship). It occurs to me (as I'm flipping through various BFG:R stuff) that another good ship for comparison would be the Omnissiah's Victory (the Ark Mechanicus in the AdMech book). It's the same cost and has some similarities in its stat-line to the Dethroner (like the 5 turrets). In fact, I might say that a good fluff explanation for the Dethroner having 5 turrets is that it was originally a Dark Mechanicum design; a sort of Chaos Ark Mechanicus. In any case, the OV has 20@60cm Gunnery (LR), 6@60cm Lances (2L, 2R, and 2FLR), and a Nova Cannon. Along with that it's got some fancy special rules - enemy gunnery gets a right shift against it, enemy lances only hit it on a 5+, its own gunnery gets a left shift, and its own lances score 2 hits on a roll of 6. So generally speaking, a Dethroner with 20@60cm (FLR) Gunnery, 6@45cm (LR) lances, S9 torpedoes and 6 launch bays with the AAF drawback should be approximately the same, at least as far as I understand. (The Nova Cannon swaps for the torpedoes, and the launch bays + drawback swap for the fancy special rules). Anyway, this is all just another possible angle of comparison. I'd say try it out a few times and see how it feels. If it's too strong you can always back it off a bit. As usual, thanks for your comments! I'm assuming you spotted this while doing the AdMech codex for BFG:XR. I don't feel like the Dethroner deserves the 20WB, with the most plausible fix being the addition of 2 more Launch Bays. This will make it compete with the Despoiler but it wouldn't be outright better. I'll post a comparison of the 4 ships in a bit (Dethroner, Despoiler, Ark Mechanicus and Desecrator) so I can see how they all compare to the modified Dethroner. Ok, time to compare! I'll compare the updated Dethroner (shown below) to the Chaos Desecrator Battleship, the Chaos Despoiler Battleship, the AdMech Ark Mechanicus and the Imperial Emperor Battleship. During the War in the Purity sub-sector in the 38th Millenium, the engines of the Statio Damnatibus were refitted and the mass of the ship was reduced. The ship gains +5cm of speed, but has a reduce launch bay capacity from 4 to 3 at no extra cost. Verdict: Sounds fair; that +1 Leadership on the Emperor coupled with both being Ordnance-reliant ships makes a great difference. Verdict: Definitely fair, Nova Cannon, Armoured Prow, Advanced Shields and Augmented Weapon Relays make this a leviathan compared to the Dethroner. The only real advantage the Dethroner has is in it's ordnance, but that requires a permanent command check to keep working basically. Overall verdict: Think this new iteration of the Dethroner is a balanced ship when compared to the similar ships that are available. I also feel it is different enough to warrant its place in the Chaos Battleship lineup. Anybody want to comment on this? If you do, please comment on the individual comparisons as well as the general conclusion. Thanks! Then the standard 6 torpedoes. This way it just looks pretty in terms of the numbers used and in case of criticals there's no rounding numbers. TBH, I've been thinking about reducing the WB to 7 and 5 if it needs a slight nerf, but I think it's pretty balanced with what's out there so far.